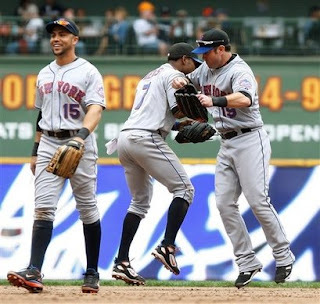 Mets Embarrass Brewers In Sweep ~ The Bucky Channel - The World of Sports from Wisconsin's Perspective. If the Brewers actually do pull this off and make the playoffs for the first time since 1982, it's likely they are going to end up facing the Mets in an NLDS. If this series is any indication of how that would go, well then, things don't look so good. Looking to salvage the series against this Mets, this one was pretty much over before it started. Lead by a Ryan Church grand slam, the Mets took a 6-0 lead in the 1st inning. They never looked back, and eventually won the game 9-2. It was Dave Bush who was the victim in today's outing. He did last five innings in his 10th loss of the season. J.J. Hardy hit his 21st home run of the season today, but that was about it as far as offensive highlights. Many of the Septemeber Ten (that's my new name for the callups) got some playing time today, and not just as a pinch hitter. Alcides Escobar, Brad Nelson, and Mat Gamel all saw some time in the infield. The next time these teams will meet won't be until next season, unless it's in the playoffs. Even though they swept us, I'm still not entirely worried, in part due to the teams around us have been struggling as well. As of this writing, the Brewers are still within striking distance of the Cubs, and still have a four game lead in the Wild Card. Even though there is a little breathing room, the Brewers can not afford another series like this again this year. They'll try to redeem themselves staring tomorrow with a four game set against San Diego.